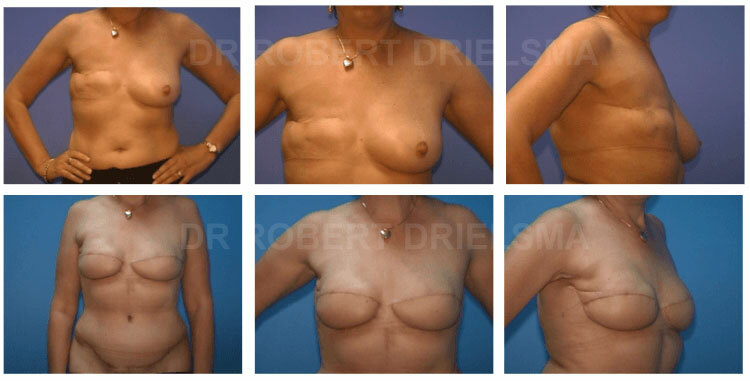 Below are some examples of Breast Reconstruction Before and After Photos by Dr Robert Drielsma, one of Sydney’s leading specialist breast surgeons. More examples of Breast Reconstruction Before and After Photos are available at our clinic. These can be viewed during your consultation as some previous patients prefer we show their before and after images in our clinic. Dr Robert Drielsma, a highly experienced specialist breast surgeon, focuses on natural-look results that can help you balance your natural proportions. Further, with modern advances in plastic and reconstructive surgery and microsurgery, women can now opt to have breast reconstruction that can be natural in appearance and feel. For women undergoing breast reconstruction, feeling “whole and normal” again is a great boost to their self image and esteem. Dr Drielsma also operates from accredited major hospitals using only experienced anaesthetists, with a top team of surgical support staff.